MEN: The Scribes Men acquitted themselves well last Saturday at Rupert Park versus Surrey, though the closely contested match did not produce the desired result for the home side. 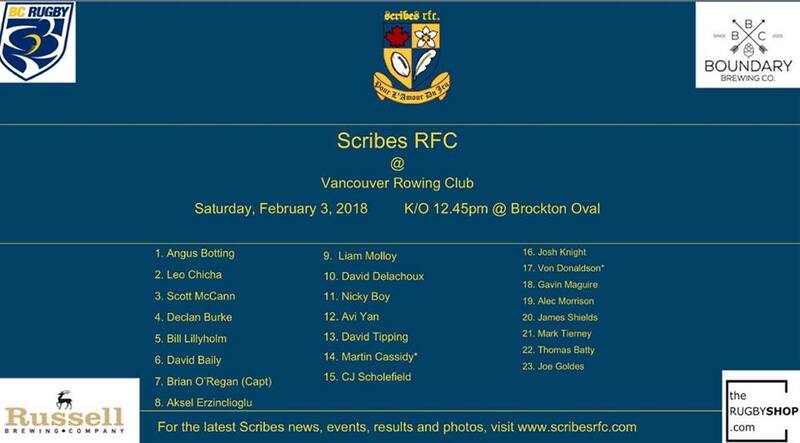 This coming weekend, Scribes will once again be tested by one of the leading sides in Division 2, as they travel to the Vancouver Rowing Club. The Rowers showed their quality the last time these two sides squared off back in November, with the men in red and white hoops bending to some early Scribes pressure before regathering themselves for a 26-10 win. Scribes will need to find more variation in their attack to break down the Rowers defense, but a water-logged field at Brockton Oval and more rain on the way could make for difficult scoring conditions. Kick off is set for 12:45pm on Saturday. WOMEN: The Scribes Women continued to build upon the success of late 2017, having started off 2018 with an impressive 44-0 win over Langley last Saturday. The Scribes attack looked almost as sharp as their shiny new yellow kit, and the Rowers depth and shape will be under heavy scrutiny on Saturday. Scribes were relentless with go-forward ball when these two sides met last November, as the women from East Vancouver cruised to a 27-5 victory. Since that meeting, however, the Rowers have grown in confidence, stunning Capilano with a 17-17 result and blasting Surrey 54-14. It will serve Scribes well to score early and assert their style of play on this match. This Saturday’s kick off at Brockton Oval is scheduled for 11:15am.